Strength Training is a multi-authored book, edited by Lee Brown, EdD, and endorsed by the National Strength & Conditioning Assoc. (NSCA). • Recommended for: Serious weight-trainers and first-year students in exercise physiology, physical therapy, and related exercise sciences. • Lee Brown, EdD, CSCS, FACSM is the editor. He has impressive credentials, including, certified strength and conditioning specialist (NSCA), certified health and fitness instructor (ACSM), certified club coach (USA Weightlifting), and is the current president of the National Strength and Conditioning Assoc. (NSCA). Brown earned a masters degree in exercise science and a doctorate in educational leadership. In 2003, he received the NSCA Outstanding Young Investigator award for his research in high-velocity exercise. • Michael Barnes, MEd, CSCS, NSCA-CPT is the educational director for NSCA. • Sagir Bera, MS, ATC, CSCS is currently pursuing a degree in medicine. • Keith Cinea, MA, CSCS, NSCA-CPT is the editor for several of NSCA's publications. • Avery Faigenbaum, EdD, CSCS, FACSM is an associate professor in the dept. of health and exercise science at the College of New Jersey. • Brian Findley, MEd, CSCS is professor and department chair of health and wellness at Palm Beach Community College in Boca Raton, FL. He is currently pursuing a PhD. • Steven Fleck, PhD, CSCS is professor and chair of the sport science department at Colorado College in Colorado Springs. • Maren Fragala, MS is currently a doctoral fellow in the department of kinesiology at the University of Connecticut. • Disa Hatfield, MS is currently a doctoral fellow in the department of kinesiology at the University of Connecticut. • Jay Hoffman, PhD, FACSM, CSCS is professor and chair of the department of health and exercise science at the College of New Jersey. • William Kraemer, PhD, CSCS is a professor in the School of Education and the School of Medicine at the University of Connecticut. • Daniel Murray, MS, PT, CSCS is a physical therapist and is affiliated with Northeastern University. • Barry Spiering, MS, CSCS is currently a doctoral fellow in the department of kinesiology at the University of Connecticut. • Jakob Vingren, MS is currently a doctoral fellow in the department of kinesiology at the University of Connecticut. • Jeff Volek, PhD, RD is an assistant professor in the department of kinesiology at the University of Connecticut. Strength Training is a visually-attractive book that contains a lot of great information written by highly-qualified people. It also carries the endorsement of the National Strength & Conditioning Association; a publication on resistance training couldn't ask for a better endorsement. Further, one of the authors, William Kraemer, PhD, is one of the leading -- if not the leading -- authority on strength training principles. And the editors deserve credit for being comprehensive. They include relevant topics such as plyometrics, training with resistance bands (which are very popular right now), and a section on injuries. Unfortunately, I feel they try to do too much with this book. Since much of the phrasing is written as if someone is speaking to you directly (ie., "here's what you need to do..."), and, because they state in the Preface that the book is intended "...for those who want to know the best way to build strength...", it seems as though they feel the target audience is the average person or the weekend warrior. However, a substantial part of this book contains material that is far too complex for the average reader. Chapter 1 belongs in an academic textbook, not a book for consumers. Chapter 2 is a little more relevant for general readers, but discussions of muscle fiber types, and the muscle proteins actin and myosin are not. On p. 42, the authors choose to use MRI images to demonstrate the changes that occur in a woman's upper arm in response to strength training. Instead, a simple before and after photograph of the subject's arm (or body) would have been much more effective to illustrate this concept to the average reader. Throughout the book, there are also anatomical diagrams with the Latin names for each muscle. The non-academic reader doesn't need, or want, this. Despite the overall comprehensiveness of the text, a clear explanation of how to determine 1-RM was lacking. Page 50 discusses the importance of the 1-RM, but doesn't explain how to calculate it. Page 101 explains how to determine it using the actual bench-press protocol, however, few, if any, deconditioned or senior subjects will be able to do this. Table 5.1 on p.102-103 offers no explanation of how to read it. On p. 103, the authors mention that 1-RM can be estimated using equations, but none are provided. Considering how important the 1-RM value is in crafting an appropriate, customized training regimen, there should be a better "how to" explanation that all readers can understand. • Photos: One of the strengths of this book is the collection of excellent photos. It contains dozens of large, full-color photos of "real" people (ie., not enormous body-builders) demonstrating proper technique for many barbell and dumbbell exercises. One detail that was a smart decision regarding the photos was to use clear (plexi-glass) discs on the barbell (ie., instead of plates). This "see through" aspect allows the reader to see the hand position on the barbell when the image is a side view. Another nice feature on many photos are the guidelines for proper technique. However, while most of the photos are excellent, some are too dark. This is aggravated by the fact that the models are often photographed wearing black shorts while exercising on a black mat, or against a very dark background. Also, of the many dozens of photos in this book, only 1 is of a senior, and only 2 are of children. The rest of the photos utilize models that appear to be in their 20's. Considering the poor state of fitness of both children and seniors in this country, it would be nice to see more examples of these age groups featured in the book. Seeing images of their peers might help kick-start a fitness attitude in some in those age groups. Certainly, it couldn't hurt. • What I Liked About This Book: I was impressed with the appearance of this book the minute I opened it. It is visually appealing and the page layouts are well done. Part III "Exercise Technique" is loaded with tons of great photos of people demonstrating proper form while doing a multitude of different exercises. 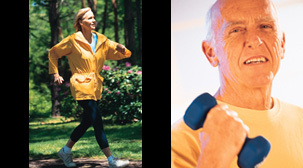 For each exercise, several tips or guidelines are offered. This section of the book is very well done. • What Could Be Better: One thing that always bothers me when scientific and/or health content is created for consumers is the inclusion of medical terminology. 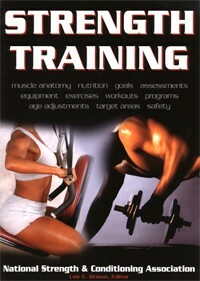 This occurs in Part IV, where specific training programs are detailed. While some fitness enthusiasts will know what terms like "shoulder extension" means, most consumers won't. In general, I like this book. But, I am a little confused. It appears that the intent was to create a resource for non-academics. However, a substantial part of this book is clearly intended for an academic audience. For students in programs like exercise science, kinesiology, and physical therapy, this book is a great reference and I recommend it for that audience. This book is also a good reference for consumers, if they understand that some sections will be over their head. Last, but certainly not least, the authors and editors have succeeded in creating a comprehensive book on resistance training that is based on solid scientific research.